As I mentioned in my Texas Cocktail News for July, Absolut released its Absolut Texas vodka, which combines serrano chiles with cucumber. I don't know why they chose cucumber, but for some reason, they associated it with Texas. Go figure. and top it off with seltzer water. They loved it. 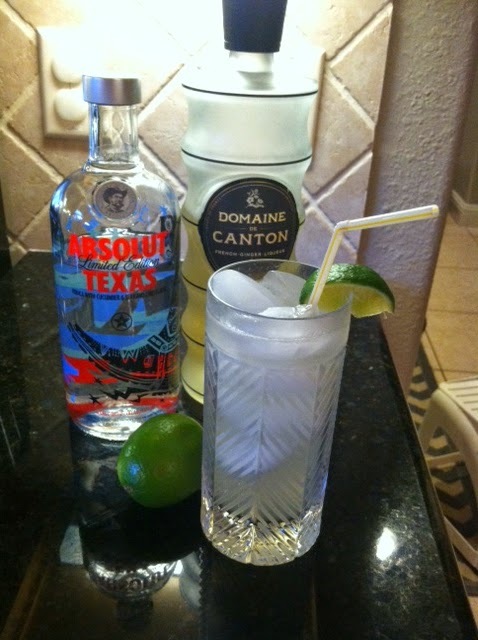 The spiciness of the Absolut Texas plays nicely with the spicy sweetness of the Domaine de Canton. So grab a bottle of the limited edition Absolut and play around with the cucumber and spices. I'm thinking a good Vodka Tonic is in order, perhaps with a cucumber garnish. Or maybe a Vodka Gimlet. Cucumber and spice are usually a nice addition to any vodka cocktail, so Absolut Texas makes for a well-used addition to any liquor cabinet.